As the cast grew larger and the action stunts more unbelievable, Furious 7 was thrown a curveball when lead actor Paul Walker tragically died in the middle of production. Although this is not the first time a film has had to recover from the loss of a cast member, it may be the first case in which the most cutting edge effects were meant to go unnoticed. When Heath Ledger died before finishing the filming of The Imaginarium of Doctor Parnassus, he was replaced by other actors with the help of the fantasy storyline and some creative editing, but Furious 7 was finished while attempting to disguise the difficulty of a missing cast member. This was done with the help of Walker’s brother as a stand-in, unused footage, and CGI to blend it all together seamlessly. Some of these tricks are more noticeable than others; scenes with heavy CGI tend to be hidden within darker cinematography, Walker’s character has a habit of leaving scenes to let other characters discuss details, and the actor’s face is often obscured with clever choreography. But in a film franchise with increasingly absurd action sequences, these may be the most believable moments of special effects in the film. Even more importantly for the fans, Furious 7 feels like a sincere sendoff for the Walker. This was easily the franchise he was best known for, and it serves as a fittingly sentimental goodbye for the actor, despite also being a massively overloaded action blockbuster filled with the usual one-liners and vehicular ridiculousness. The film itself likely would have come and gone without nearly the same amount of attention if it weren’t for Walker’s passing, but that doesn’t mean it fails to live up to the expectations of the franchise. For one thing, Jason Statham finally makes his debut into the series as the ultimate bad guy. Since his turn as the deadly driver from the Transporter franchise, Statham has been nearly as synonymous with overblown car stunts as the members of the Fast and Furious crew. Deckard Shaw (Statham) is the brother of the Fast 6 villain (played by Luke Evans), but he is only one of the obstacles faced by the crew. Also joining the cast of bad guys is Oscar-nominated Djimon Hounsou, wrestler Ronda Rousey, and Tony Jaa in his first English-speaking role. Kurt Russell also joined the cast as another ally to the gang, along with the return of Dwayne Johnson’s character. With each addition to the series, the cast gets larger and the stunts more unbelievable, and more films in the franchise are currently in the works. These aren’t action movies for the thinking man, but instead seem to have filled the void of silly action that was left when James Bond started taking himself seriously. 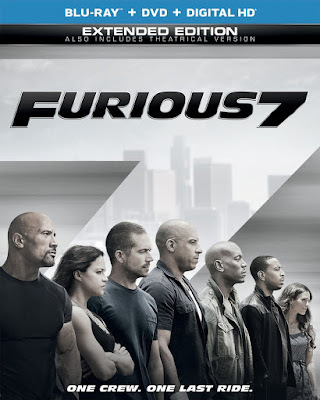 These films are fun and full of spectacle, and Furious 7 is no exception. What is most surprising about this latest installment is the level of sentimentality it carries with it, fittingly dedicated to a cast member that will be missed in the future releases. The Blu-ray release comes with a number of exclusive extras, including an extended edition of the film that adds two minutes to the 138-minute running-time. Also exclusive to the Blu-ray are a handful of deleted scenes, five featurettes and a music video. The featurettes primarily cover the major action sequences in the movie, as well as one about the impressive cast of automobiles used. Also in the extras are two additional features, and a making-of the Fast & Furious ride recently opened at Universal Studios. The two disc package also has a DVD and Digital HD copy of the movie.